We take allergies and intolerances seriously. 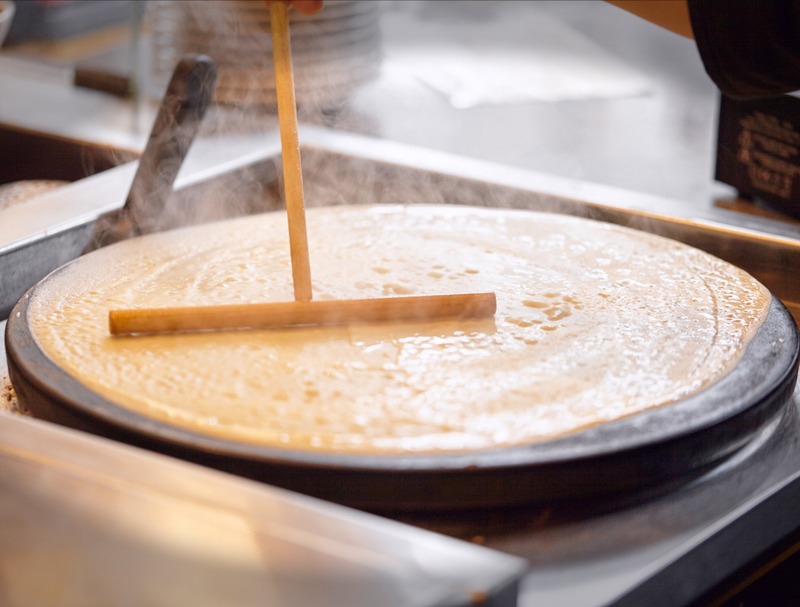 We want to make you aware of what we already do, as well as what we are going to do to improve the way we deal with allergens at Crêpeaffaire. – and celery (e.g. Goat Deluxe recipe). We offer gluten free, vegan, buckwheat galettes as an alternative to our crepe mix, however please be aware that not all toppings & fillings are gluten free or vegan except where specified. While we take a number of steps to minimise the risk of cross contamination, we cannot guarantee that any of our products are 100% safe to consume for people with serious allergies. For example, we have processes to help keep our gluten and dairy products separate from our free-from offerings, but in a fast paced open kitchen, these products can be stored and made in close proximity to one another. If you have a serious reaction to a certain allergen, it is incredibly important that you clearly inform the duty manager of the store you are dining in and that you make your own decision about whether you are able to manage any risk from allergens held and used on site in close proximity. We have a Menu page on our website which gives a full list of allergens contained within the products sold. This can be accessed via a mobile, desktop, or via our mobile application. We also have a downloadable PDF on our website listing nutrition & allergens for our main menu items. All staff will also have access to this sheet. Please note, if you add extra items to your order e.g. Nutella, the allergen information may change. On our menu page, we have an allergen disclaimer. In order to alert and remind our customers that any of our products may contain nuts, we display an allergen warning sticker near the tills. We have always ensured that our Nutella bottles are separately identified and have recently increased labelling – these now have NUT warning stickers in order to prevent cross contamination. For non-dairy milk, we use a separate marked stainless steel jug. We clean the steam wand thoroughly before and after each use. We are looking into new ways to improve our allergen communications on our in-store menu boards. We are also working with delivery partners on making allergen information more accessible via their channels. Every Team Member receives training in our allergen & cross contamination procedures and policies. Store teams have access to our allergen information. Please speak to a member of staff before ordering anything, if you have an allergy and let them know how severe this is. We will never accept our Team Members guessing and neither should you. If you are in doubt that someone really knows, please don’t be afraid to check with the store’s Duty Manager.